A highly subjective musical take on what it means not only to write an opera, but to encompass and even embody one in the modern age of internet witnessed its world premiere launching on April 5th at Dixon Place, New York City’s “Laboratory for Performance.” Written, composed and performed by ASCAP member Joseph Keckler, this conceptual tour-de-force also provided a vehicle for fellow ASCAP member Patrick Grant, collaborating as music producer, with violin arrangements added to the artistic mix by Dan Bartfield. Directed by Uwe Mengel, this highly operatic exposure of Keckler’s inner subconscious, transparent at its most ridiculous and sublime, is propelled through a multi-media series of phantasmagoric tableaux with many an unexpected turn. “I Am an Opera” steadily escalates with its unspoken pronouncement that life, especially at its most primal and personal, is supreme artistic game. Performances will take place on Friday and Saturday evenings throughout the month of April. 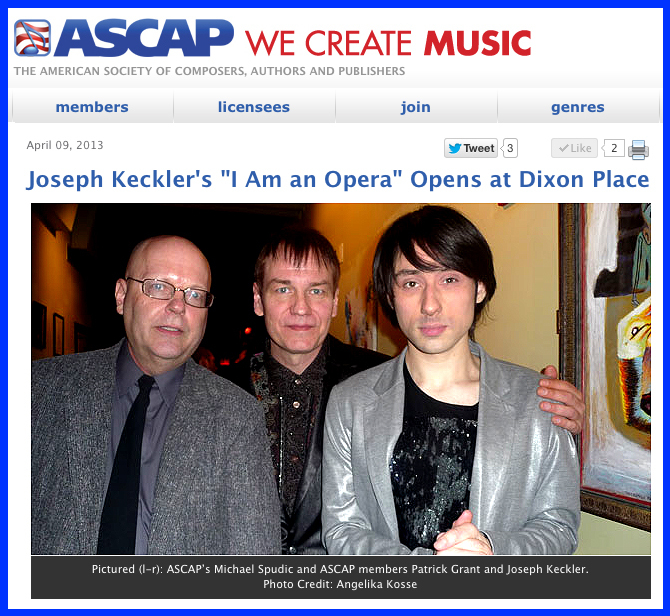 This entry was posted in 1 - MUSIC, 2 - MISE-EN-SCENE, 3 - MOVEMENT, 5 - MONTAGE, 7 - MIXED MEDIA and tagged ascap, dan bartfield, dixon place, joseph keckler, music, New York City, opera, Patrick Grant, performance, theater, uwe mengel. Bookmark the permalink.